I’m glad you asked. 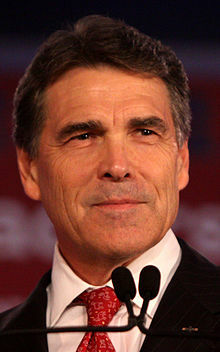 Perry is a typical Texas ex-Democrat Republican. Like other long-term politicians, he has in the past expressed some misguided impulses about the power and potential of government. But, he has been reading up on classical economics and particularly in the past few years, has gotten a gullet-full of intrusive and corruptive federal government and become very focused on Tenth Amendment propriety. Not long ago, he published a book called “Fed Up.” I wouldn’t be disappointed with a Perry nomination, but I’d hope he had a wise and capable Veep and advisors. I would be a Palin supporter: not because of her exceptionally long and celebrated executive record, though her record is very good. (By the way, Mitt Romney served only one term as Mass governor.) And not because she has meticulously explicated a full systematic philosophy of governing. But because A) she has a matchless Pied Piperish capacity to inspire and move people. And B) She has definite what she calls “common-sense conservatism” and a truckloads of fortitude and purpose. I’ve never exactly seen the like. But it’s a quantity that Republicans would be foolish to waste, which unfortunately they have always proven themselves quite capable of. It’s true that she has cakes of PR mud to remove from the smearing of her character and reputation, but if given the chance, she would be Reagan-like capable of sloughing it off. But the record of her rise and accomplishments is golden. Anyone who hasn’t, should see “The Undefeated.” I haven’t yet actually, but I will and have already read about her record in government. So, I would favor a ticket of Palin and Perry. Palin as the power and the sizzle, and Perry as the long-term executive and reputational ballast. On the record of the past several years, Perry would learn a lot from 4 or 8 years of watching the charisma and executive buzz-saw of Palin at work. And by the way, I think both would be excellent to work with on a de-centralized and market approach to healthcare. Perry is going to have to do a whole lot more than come up with catchy conservative cliches to win the White House, or even to win the GOP nomination. The economic record of the state he's led longer than any other governor is not really all that great. Housing has tanked, there are 26 states with a better unemployment percentage, and it is hard to explain why Texans spend 5% more of their income on taxes than residents of New York or Massachussetts, even though it doesn't have a personal income tax. It is also hard to explain how a governor of Texas can take credit for anything that happens in the state, since the only thing the governor of Texas can do is veto legislation and call the legislature into session. The Lieutenant Governor is the agenda setter and the driving force behind what the state legislature accomplishes. For a cliche speaker like Perry, being governor of Texas is a good job. But being President requires brains, character, strong, positive leadership and honesty, and Perry is sorely lacking in most of those areas. I don't think it will take this large and relatively aggressive GOP field very long to find a weak point, invade it, and send his White House hopes back to Paint Creek. It never ceases to amaze me how number are picked out of the sky and thrown about as if they are accurate or really representative of the truth. The line about Texans paying 5% more in taxes than New Yorkers or Mass residents rings of this type of hogwash. I would like to see links to reputable stats that verify this comment. I've been seeing and hearing how Texas is in debt some $90 million/billion where in fact we are not in debt. The number the left is quoting is our state budget which is money we spend to run the state. NOT debt as it is being lied about. The left and some of the right have no issue with lying but it sure does get old when people are trying to figure out the facts for themselves. Governor Perry has done a great job in being the point man in determining where Texas is headed and how the state is going to get there. When you bring in more jobs than any other state during recent times you're doing what you've been asked to do by the voters. No other Governor can match that record. A certain state and (one term) federal legislator who's sitting in the oval office now definitely can't match anything that anyone in history has done other than pulling the wool over a whole lot of very stupid people to get elected to the presidency! A man who still hasn't released his college transcripts but the left is busy trying to find something in Perry's transcripts that they can make a big deal out of. Amen Robert! So glad we do still have some very well informed Texans!